Pitching a tent is a tricky affair particularly if you’re a beginner or even worse, if faced by extremities such as sudden rainfall, strong winds and so on. Having a grasp on basic knowledge on the whole procedure can greatly help in lessening the effects of most of these challenges. 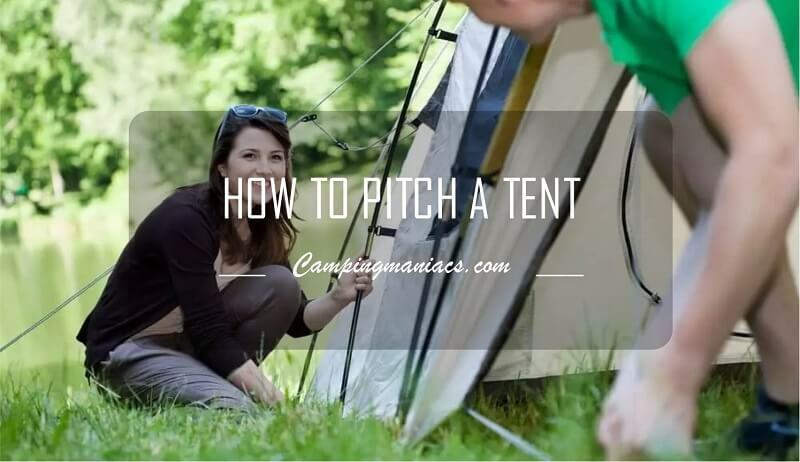 With regular practice and strict adherence to the basic steps and tips below, pitching a tent won’t be as daunting. A properly setup tent will protect you against winds, rain and/or any other outdoor nuisances for a relaxing night’s sleep. The tent gear will at the very least comprise of; the tent itself, a tarpaulin or a ground sheet, poles, stakes and a rainfly. A checklist with all the camping essentials can help you keep track of everything before heading out for the camp. Always pack the items in a manner that ensures you get the first things for the tent setup out first. Get yourself a mallet to pound in the pegs or stakes into the ground. You can also get a peg remover to help in disassembling the tent. A handheld brush is also perfect for sweeping out your tent as well as brushing down the tarp or tent base at the end of the break. Other essentials for your shelter may include a sleeping pad, a sleeping bag, roll mats and a headrest etc. This also includes basic camping gear and safety tools like insect repellents, first aid kit, and cookware among others. Most campgrounds will have designated and well developed campsites. However, if you are camping out of such areas, it is important to be aware of what a good camping spot entails. A location on a higher ground will be better to avoid incidents of flash floods and so on. Therefore, always avoid low-lying areas, canyon floors, valleys, depressions and washes. Water will always gather at such areas. Camping near rivers and streams also exposes you to the dangers of possible flooding. Remember to take in the surroundings to ensure accessibility and overall safety. This means keeping an eye out for spider webs, beehives and the deadly Widowmaker also known as the fool killer. A Widowmaker is a rotten or low-hanging tree branch that is bound to fall at any time. The spot should be far enough away from fire pits to prevent the risk of embers landing on the tent. 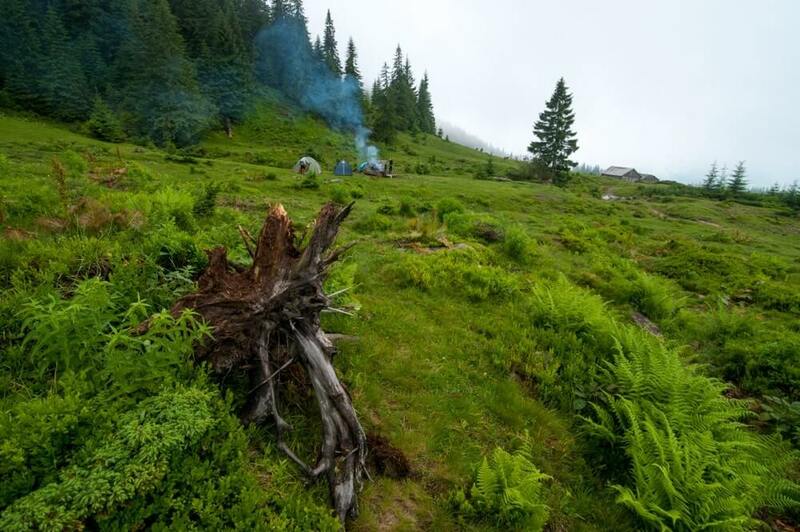 You should also camp at least 200 feet away from water sources to avoid risks of flash floods and water contamination. Also, always look for signs of creepy critters around the area and carry along repellent measures. Tents don’t fare well with climate control and thus setting up in direct sunlight will add excessive heat inside the tent. Patterns like the setting of the sun can give you an idea on how sunlight will hit the tent. Remember to take into account the rules and regulations regarding a given area plus be ready to practice the Leave No Trace principles. The tent setup process will be different from tent to tent. Most modern types have an inner compartment, a fly sheet, and poles that form dome or tunnel-like structures. These tent types will follow the steps outlined below. Kindly note that setting up a tent comes after identifying the most ideal camping spot possible. The first step is to lay out the tent’s footprint by laying a protective tarp or groundsheet on the ground. The tarp provides a barrier between the base of the tent and the ground. It protects the tent from gathering moisture from underneath thus improving the tent’s overall lifespan. The tarp also assists in smoothing out the ground for extra comfort and keeps the tent base clean from dirt, wetness or dust when packing. If the footprint is larger than the floor of the tent, make sure to tuck the visible edges beneath. This ensures that water collected by the rainfly doesn’t get underneath the tent base over the tarp. Unfold the tent, identify the base of the tent and lay that side on top of the tarp or groundsheet taking into account where you want the door to be. The direction of the door will be especially important to factor in when using a bigger tent as it will be difficult to reposition it once set up. Separate out the tent poles and fly, and ready the pegs/stakes for use. Keep a record of the number of tent pegs to counter-check when packing. Tent poles are usually in bits that are linked together with a stretchy cord or bungee ropes to make them foldable and easier to store. Prepare the tent poles by connecting the various sections and lay them out across the flat tent. Refer to the instructions manual or attach the poles with corresponding numbers or colors, otherwise you may label them for more ease next time. The interlinked sections of the tent poles dictate that they must be connected using a push action instead of a pull action. Pulling may detach the tent poles and lead to more frustrations when setting up the tent. Most tents require only two tent poles crossing each other to form an X as part of the frame. Some tents will require you to connect to the outer fly before clipping in the inner side. In this case place the ends of the poles into the pole attachments. Bend the poles to fit them in place and lastly clip the top and sides of the inner tent onto the poles. On the other hand, other tents have sleeves/flaps as opposed to having clips to connect the poles. Simply slide the tent poles through the sleeves then secure the pole ends into the attachments at the base of the tent. Some tents also have a tie at the peak of the inner tent keep the poles intact with the top with a simple bow. Staking your tent holds the tent and anything else inside, in one place in case of sudden gusts of wind. Ensure the door is facing the right direction, away from the wind’s direction, before staking the tent. If it isn’t simply turn the tent and tarp to the right direction. 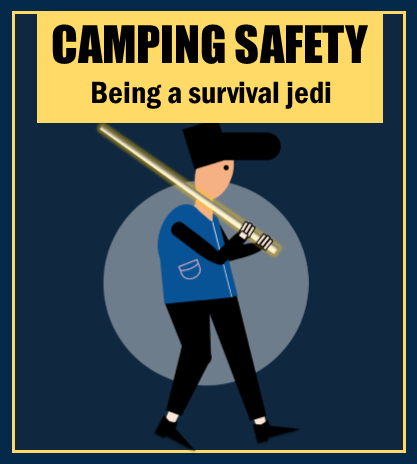 The poles for a self-standing tent will bend in place to raise the tent itself while in a regular tent you may be required to slowly bend the poles and the raise the tent in place. 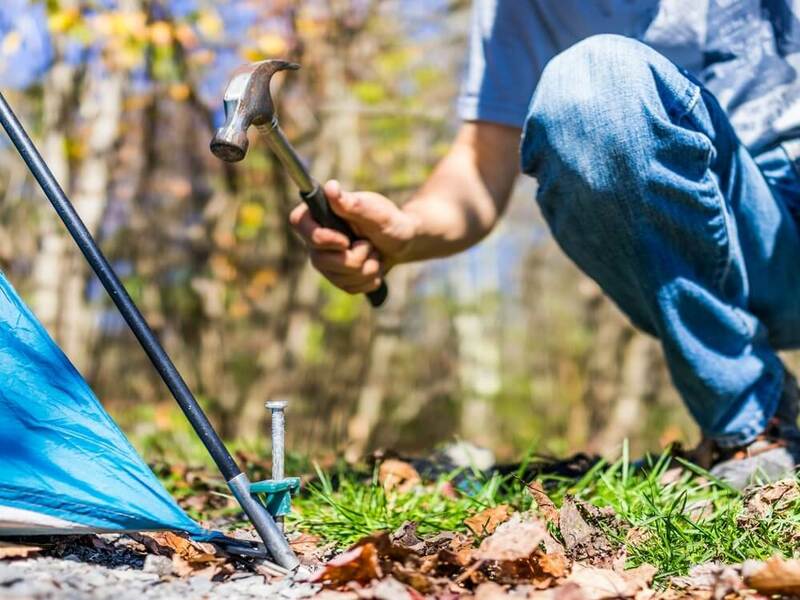 Use a peg/stake to secure the four tent corners to the ground. Add some tension on the tent by pulling the corners away from each other to remove any slack before placing the stakes or pegs. The stakes should be pushed far enough into the ground and at a 45% angle leaning away from the tent. The stakes should be exposed enough for easy removal when taking down and adequate for slipping a tie-down cord over them. A large rock, mallet or hammer can help drive the stakes/pegs into the ground. Always pack extra stakes as a precautionary measure. Place the rainfly over the top of the tent frame and align the fly’s door with the door of the inner tent. Use the loops or tabs on the inside of the rainfly to secure it to the poles and ensure the fly’s doors are zipped closed. Stake the fly in place, by drawing the bottom loops of the fly as far away from the inner tent as possible. Make sure to maintain an even tension across the fly to avoid it from flapping or touching the inner tent. This will make it more effective in airflow management and protecting the inner tent from any elements. Rain may stretch out the fly’s material thus you need to recheck and readjust the fly’s tension regularly. The last step is on securing your shelter to the ground or to nearby logs, rocks or trees. Guylines create extra tension across the tent thus creating more stability of the tent against high winds and so on. The guylines also help in keeping the fly away from the inner tent thus improving on air ventilation in the tent. If you have tensioners then bowline knot will work well, otherwise a trucker’s hitch will be enough to tighten the guylines at the tent stake. Guylines are attached at the guyout points on the side of the tent that the wind is coming from, however the guyout points can be added evenly around the tent for equal stabilization on all sides. A trekking pole can also be used if there’s no tree or rock nearby. Try to maintain the guylines perpendicular to the respective guyout points for increased tent strength. Notably, non-freestanding tents can’t stand without the use of guylines. While setting up a tent in dry conditions is most preferred, circumstances may force you to set one in the rain. Waiting out for rain to stop can help you avoid all the hassles of setting up in the rain altogether. Just take cover under a tarp and avoid sheltering under trees due to falling branches or lightning risks. Undoubtedly, a good quality rainfly and tarp will be very crucial in a situation like this more than ever. A waterproof bivouac sack, commonly known as a Bivy sack, is also a good precautionary measure in case the inside of the tent gets wet. The Bivy sack is lightweight, durable and it reflects back body heat very effectively. Tents with zip-out panels can be ideal as they will ensure the tent stays dry when setting up. Once the rainfly is set the panels are removed leaving a nice and dry tent. 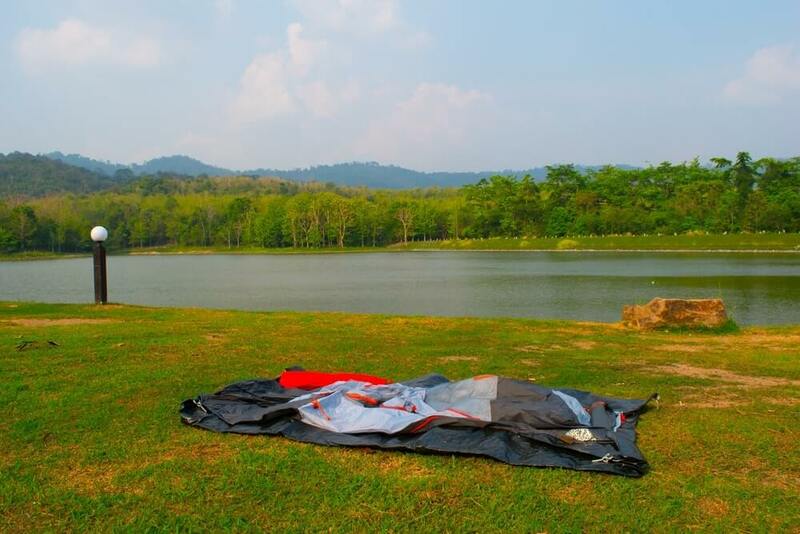 However, these kind of tents may add some extra weight which can be an issue if you are a backpacker. A single-wall tent is also easy and quicker to setup. Always wear the right footwear if you expect rain for instance waterproof hiking boots are very ideal for this situation. A possible hack for the unprepared would be duct taping your footwear on trash bags as a waterproofing measure. For dealing with wet grass and eventual puddles around the campsite, rubber boots or waders can also be ideal. On the flipside, footwear that dries fast, has firm grip on wet surfaces and is comfy to wear, is more than ideal for camping in warm climates. An example of this is sandals or any other outdoor footwear. Water removal is also a necessary consideration when dealing with rainy conditions in your campsite. A large sponge or a micro-towel and a small shovel can come in handy in removing water around your shelter. The sponge and micro-towel are for sopping/wiping out any water while the shovel can be used to divert newly formed streams and fill in puddles. Pitching a tent when it is windy can be a challenge, but it will follow most of the steps outlined above. Make sure to place something heavy enough on the fly and tent bag to prevent them from being blown away. Prep your tent poles as the first step and have your stakes in handy to pin the tent in place. 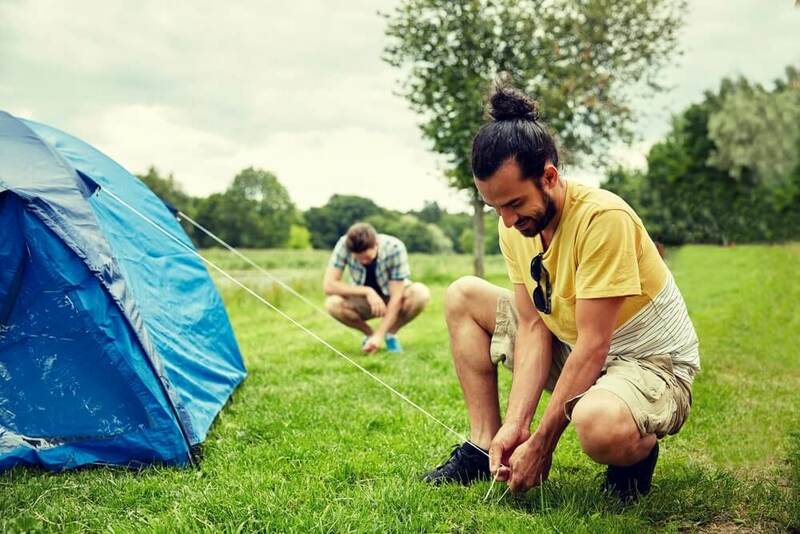 Take out the tent from the bag holding it firmly, allow the wind to blow it away from your body and then lower it to the ground and stake it immediately. Clip or sleeve the tent poles in place and remember to weigh down the tent with a backpack or something heavy. 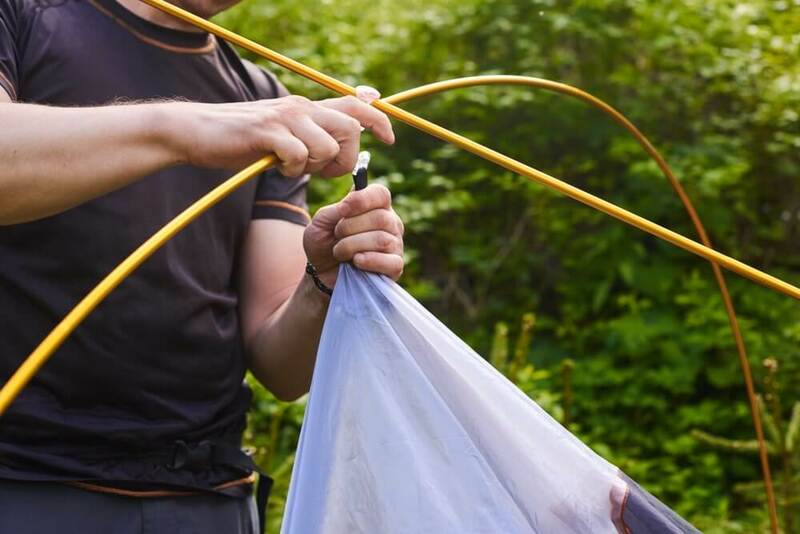 Pull out the fly and take advantage of the wind to lower it on top of the tent frame and connect it to the inner tent and poles. Guy out the tent to reduce the flapping and lower the risk of damaging the tent. A quick setup tent is perfect for easy storing and fast setups on a campsite. Generally, a portable, lightweight and weather resistant tent will be ideal. Of course there are other types of tents that may be more tailored to your needs. So do take into consideration factors like budget, total number of occupants, personal comfort level and so on. Some popular types of tents include ridge tents, tunnel tents, dome tents, semi-geodesic and geodesic tents and family tents. Practicing setting up a tent at home is highly recommended. It will help you learn how to piece up the parts together and pack the tent in its bag in an efficient and timely fashion. Most manufacturers will include an instructions manual for your specific tent model. Read and follow the instructions for a friendlier learning curve on the whole process. Plus it will also include the tent care guidelines necessary for the tent’s longevity. Moisture can form in the tent as a result of condensation and/or rain while camping. It may lead to the growth of mold and mildew, therefore always air dry your tent in the sun before packing it away to reduce moisture. This can be done by hanging it on a clothesline or on some low hanging branches. Setting camp in the daylight might sound obvious but will definitely save you a headache. Fumbling with headlamps at night affects your line of vision and may hinder you from realizing the features of a good camping spot. Learning how to set up a tent is a valuable skill to have not only for leisure outdoor camping, but also for emergency situations. A lot of practice and planning will go a long way in helping you to easily and efficiently set up a sturdy, comfy and dry outdoor shelter.